Warmth is probably not the first thing that comes to mind when Americans think of Canada, if they happen to think of Canada at all. 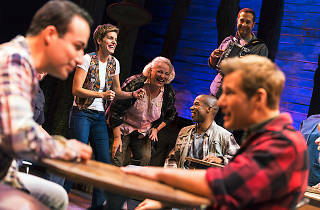 Come from Away, a swelling heart of a musical by Torontonians Irene Sankoff and David Hein, may help change that. Its unlikely subject is a true story from the immediate aftermath of the 9/11 attacks, when 38 international flights (carrying roughly 7,000 people) were forced to land in Gander, Newfoundland (population roughly 9,000). The generosity and hospitality of the locals, who housed and fed the stranded passengers for days, made the news: a small reassurance of human decency in a world smeared with ash. Although the residual shock of 9/11 gives it a strong current of emotion, Come from Away’s multiple narratives mostly have low stakes; it’s essentially a show about a bunch of people inconvenienced at once. When it touches on weightier concerns—one passenger is the mother of a missing firefighter—it falters; it is better at celebrating less consequential things, like a rowdy evening of initiation at a local bar, where the visitors are urged to kiss a cod and try a local rum called screech. A band of eight plays the spirited, Celtic-accented score, heavy on fiddle and bodhran and flute. Under Christopher Ashley’s fluid direction, the 12 versatile actors form a true ensemble cast, playing dozens of roles as both the Plane People and the plain people who welcome them to their rock. They include the gruff Gander mayor (Joel Hatch), a rookie reporter (Kendra Kassebaum), a skeptical New Yorker (Rodney Hicks), an SPCA activist (Petrina Bromley), a gay couple (Chad Kimball and Caesar Samayoa) and a middle-aged man and woman (Lee MacDougall and Sharon Wheatley) who strike up a romance; the tough-miened and supple-voiced Jenn Colella, as a veteran female pilot, has the show’s only solo number. (Geno Carr, Q. Smith and Astrid Van Wieren round out the cast.) 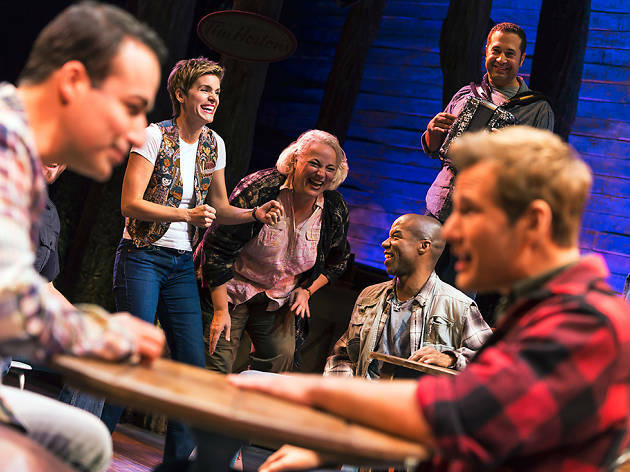 Despite minor stumbles of craft, Come from Away makes a persuasive case for the value of good intentions. For this kind of uplift you don’t need planes. Gerald Schoenfeld Theatre (Broadway). Book, music and lyrics by Irene Sankoff and David Hein. Directed by Christopher Ashley. With ensemble cast. Running time: 1hr 40mins. No intermission. Click here for tickets. I remember a critic in DC who needed to prove how wonderful he was(n't). You are more generous than he, but still perhaps too cynical for this particular musical. "When it touches on weightier concerns—one passenger is the mother of a missing firefighter—it falters;"
We did not find that to be the case at either the La Jolla Playhouse 7/2015 or Ford's Theatre 9/10/16. We found those quiet, tragic moments extremely powerful. Maybe you perceived the haltingness of the emotions portrayed as falters in the play - they are all the more powerful because of them. I would say the universal reactions of the audiences at virtually every performance I've attended or read about concur. It's OK to be happy about a piece of art. You don't always have to prove your superiority.